Covering 9,048 acres in east Alabama, the Dugger Mountain Wilderness is one of the most rugged, remote, and wild landscapes in the state. Rising to an elevation of 2,140 feet, Dugger Mountain is the second-highest peak in Alabama and also one of its most forested mountains, as logging companies have avoided its steep terrain. With large tracts of contiguous forest, the Dugger Wilderness is also one of the few places in Alabama where hikers have encountered bears. What that means for adventurous types: an excellent opportunity to experience Alabama in its wildest form, especially if you make it an overnighter in the Dugger Mountain Wilderness. Beginning in Piedmont, you can follow the well established Pinhoti Trail for a 16.4-mile out-and-back trip, or an 8.8-mile point-to-point hike. Just be aware that this is a strenuous trip with significant elevation gain and loss, and it’s most suitable for experienced backpackers. Also, carefully plan your water resupply, as some campsites aren't close to water sources, and many streams on Dugger were dry during a trip in late June. Here, more insider tips to tackle this east Alabama adventure. Begin your hike at the Pinhoti Trail Burns Trailhead off of Rabittown Road in Piedmont. You’ll enter a dense forest with thick tree canopy that shelters the path as you traverse the eastern base of Red Mountain. If you do this hike when the trees have their leaves, you’ll actually enjoy quite a bit of shade through much of the Dugger Mountain Wilderness, which is a nice relief when you’re pulling hills in 80-degree weather. While the trees provide welcome shade, they also block potential views throughout the hike. 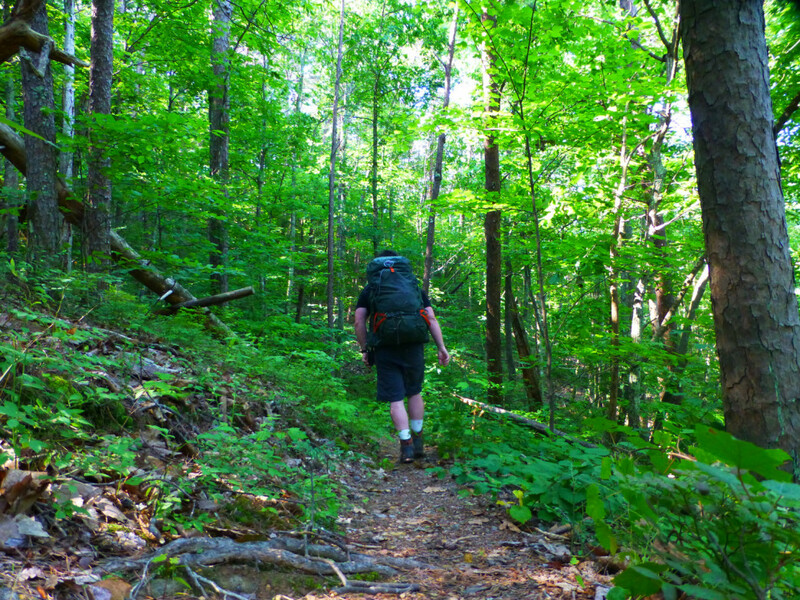 For the most part, the Dugger Mountain Wilderness wraps you in a cocoon of foliage. Within the first mile, very small breaks in the trees reveal forested ridges on your right, and this will be a familiar scene throughout the day. Occasionally, the wilderness resembles a jungle, as bushes and high groundcover envelop the trail. As you proceed along the flank of Red Mountain, you’ll move from pine trees and hardwoods to a more attractive forest filled with mature oaks. Near the 1-mile mark you might encounter considerable blow-down, as storms have toppled trees that blocked the path during our trek. As you approach the debris piles, look for small, improvised trails that loop around the mess. As you continue, the trail is like a kiddie rollercoaster, with a series of short climbs and drops. Pay attention and you’ll realize that the wilderness in home to several microclimates with a variety of plants and trees. Just before you reach the 3-mile mark, the character of the forest changes dramatically, as mosses, ferns, and deep-green mountain laurel line the trail. While you’re at altitude of less than 1,300 feet, this stretch of the Pinhoti resembles lofty portions of boreal forest in north Georgia. After leaving the corridor of laurel, you’ll transition from Red Mountain to Dugger Mountain. 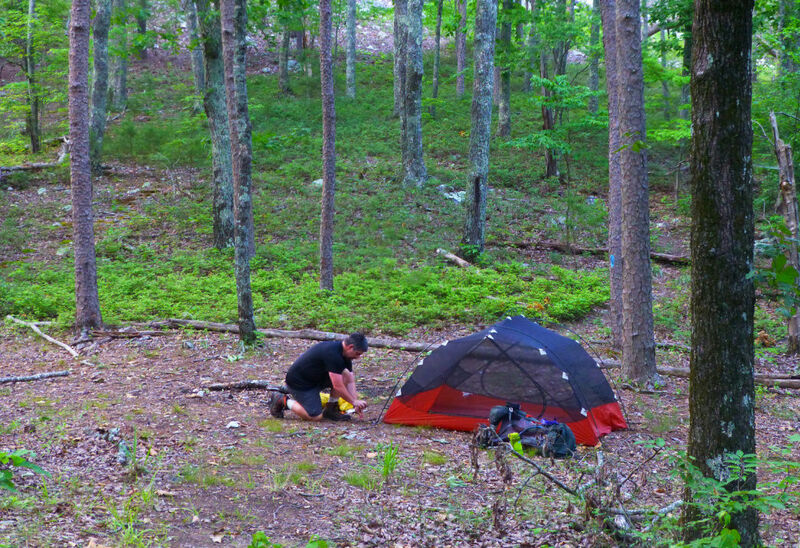 At 3.9 miles, the trail crosses a saddle with a fire ring and enough flat ground for a couple of tents. If you want to make it a short hike, you can stop here or continue another 0.3 miles to another saddle with a larger area for camping. If you skip both of these sites, you’ll travel another 4 miles before reaching the next good flat spot in Dugger Flats. After leaving the saddle, the trail traverses the crest of a ridge, with limited views of distant ridges to the east and west. This is one of those places you’ll definitely want to see in winter when the bare trees provide more windows to surrounding terrain. However, you’ll get an excellent view at the 4.8-mile mark. 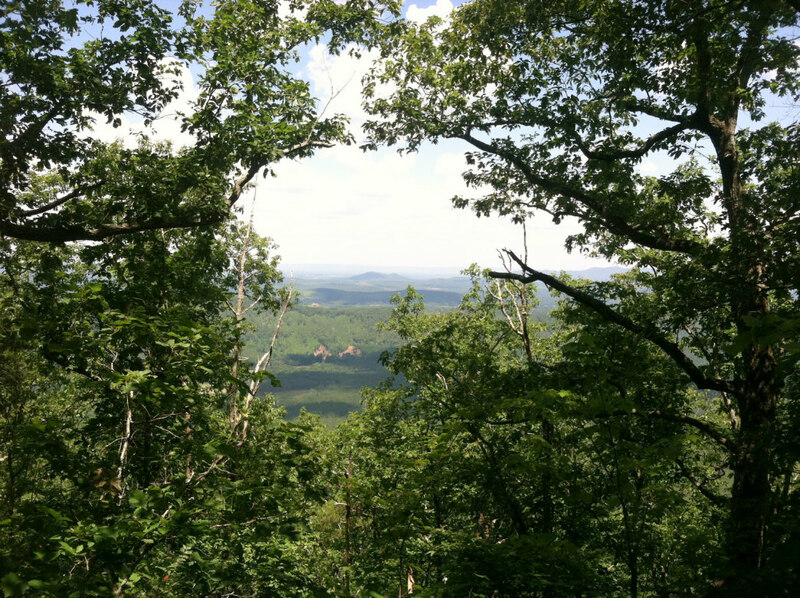 As you walk a narrow path high on the upper reaches of Dugger Mountain, a break in the canopy allows you to look north and see the broad rural landscape far bellow. The trail then climbs to its highest elevation at about 2,080 feet and skirts a hilltop where a lookout tower once stood. Having topped out, you then begin a long steady descent through towering hardwoods to reach Dugger Flats at 8.2 miles. In this broad swath of level land, fire rings dot the forest floor, and you can easily find wide plots to accommodate tents. Also, a reliable stream runs through Dugger Flats, making this an even more convenient place to camp. If you camp at Dugger Flats, you can retrace your steps the next day to return to the trailhead. Or, from Dugger Flats you can continue another half mile and end your hike where the Pinhoti Trail intersects Forest Service Road 500. At this trailhead there is a small parking area where you could leave a car. Before heading out, be sure to download these maps: Topographic map #20 and #21. Note that on Map 21, Forest Service Road 500 is mislabeled as 600. This is a strenuous hike, so be sure to carry enough food and water, as well as a water-treatment system. Bears have been sighted in the Dugger Mountain Wilderness, so hang your food when camping, and review USDA Forest Service guidelines on traveling in bear country.